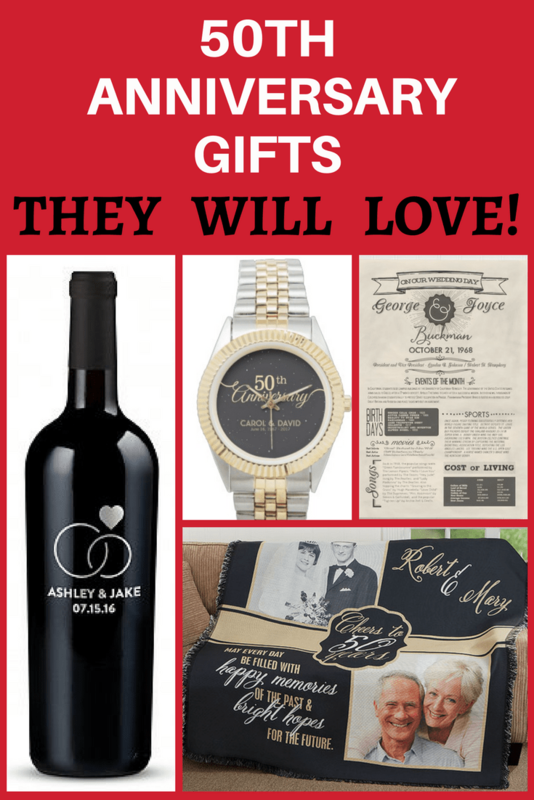 Looking for amazing 50th wedding anniversary gifts? 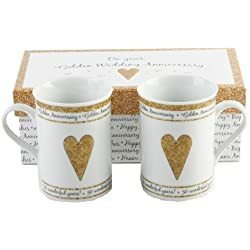 Impress the celebrants with one of these unique golden anniversary gift ideas! A 50th anniversary is a time for looking back and remembering days gone by. Your favorite couple will delight in recalling long-ago events with a custom-made anniversary book from the New York Times. 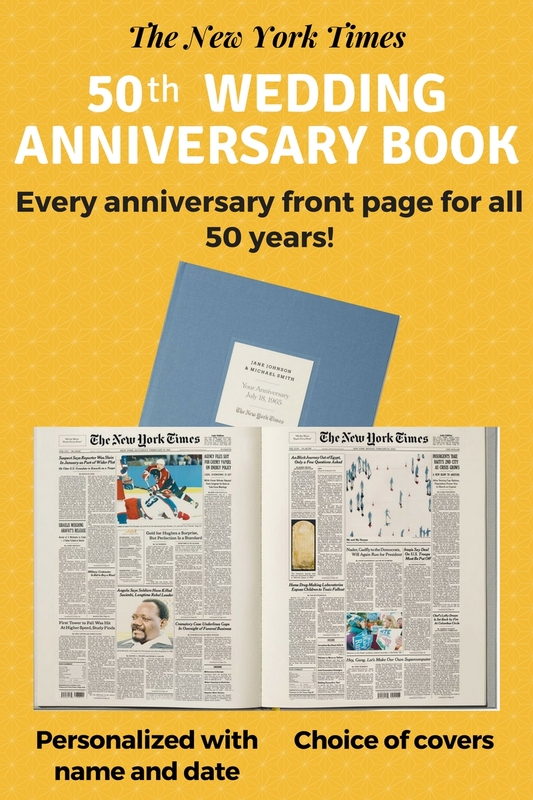 The personalized coffee table book contains all 50 New York Times front pages from their anniversary. It also includes front pages of world-changing events for a substantial book that features around 80 pages. An impressive gift that is sure to spark memories and conversation! 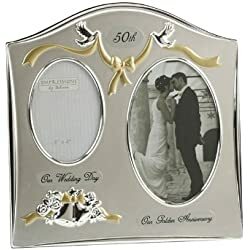 Personalized 50th Anniversary Sundial "A Love Story That Never Ends"
Looking for a beautifully symbolic 50th anniversary gift? 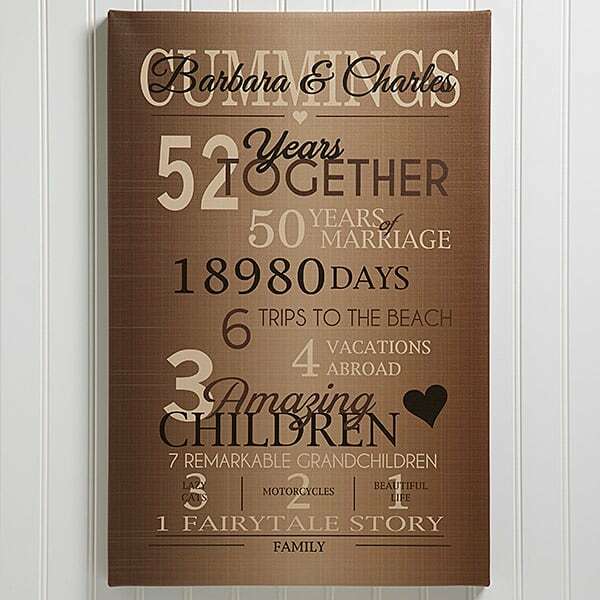 Commemorate the most important events in their life with this striking “Our Years Together” canvas. They’ll love displaying this lovely golden-toned canvas in a prominent place in their home! Just about everyone loves getting gift baskets! A gift basket is a little treasure trove suddenly appearing on your door stop, chock full of surprises and treats. GiftTree is my top pick for elegant gift baskets for all occasions. 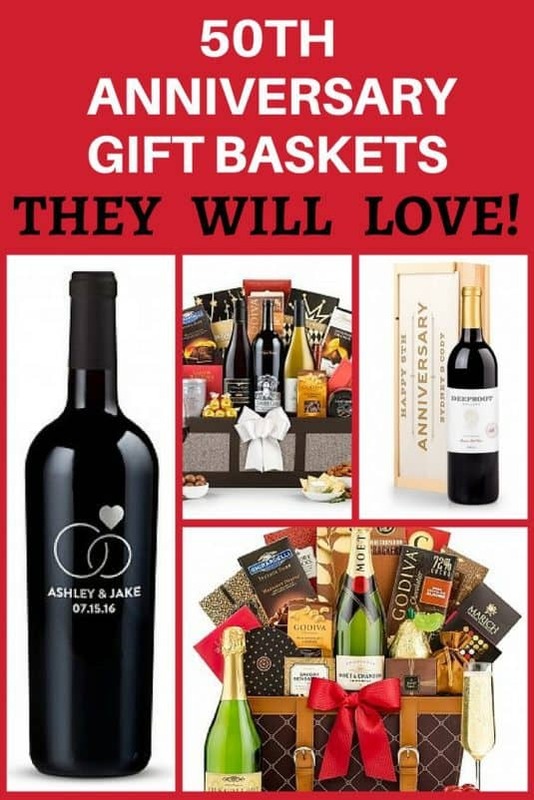 Their delightful selection of gift baskets start at under $25 and runs to over $300 for top-of-the-line champagne gift baskets. 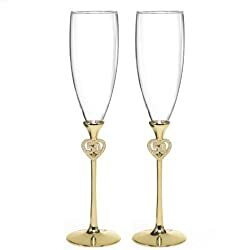 They also feature a personalized bottle of Dom Perignon champagne or an engraved bottle of Silver Oak Cabernet – either of which is a memorable choice for a fiftieth wedding anniversary gift. You can also add a personalized ribbon with your own message to many of their gift baskets, which is an easy way to impress your favorite couple. It’s always amazing to find out how much life has changed in 50 years! 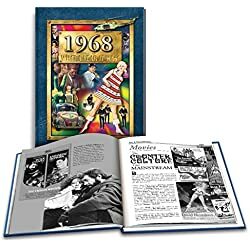 Remind the celebrants of what life was like back in the day with a gift that features historical facts and trivia from the day they were married! 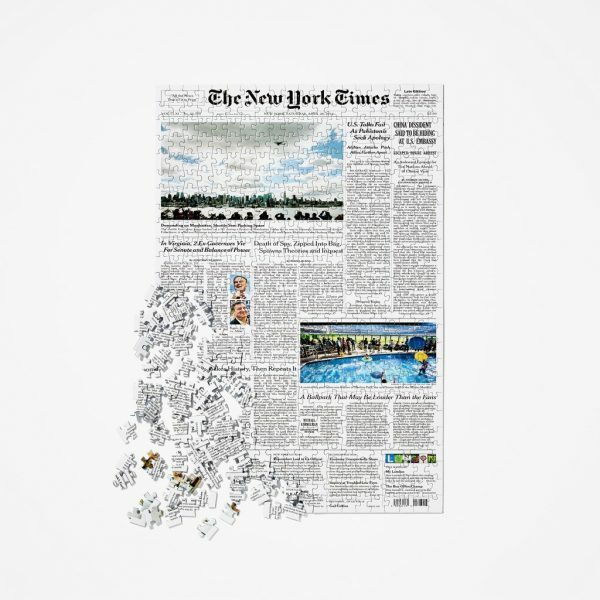 If they enjoy jigsaw puzzles, they’ll love the New York Times front page jigsaw puzzle that features a reprint from their wedding day. 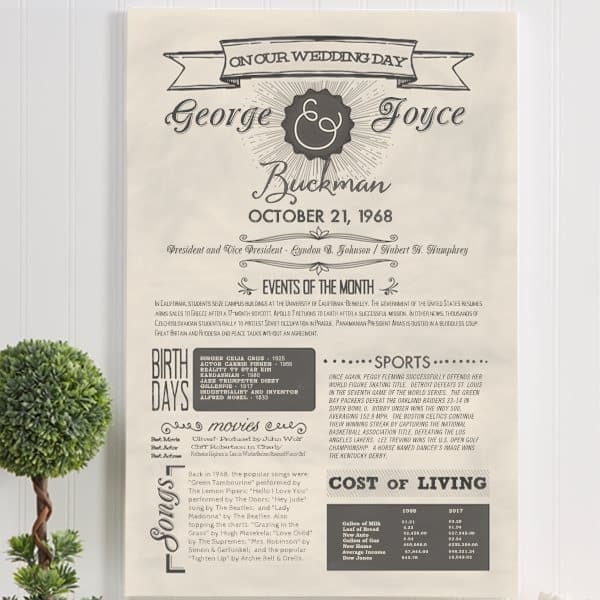 Personalization Mall offers a personalized canvas anniversary print that chronicles the top events and cost of living comparisons from their wedding date. 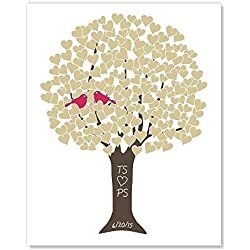 The handsome print is customized with the couple’s name and wedding date. 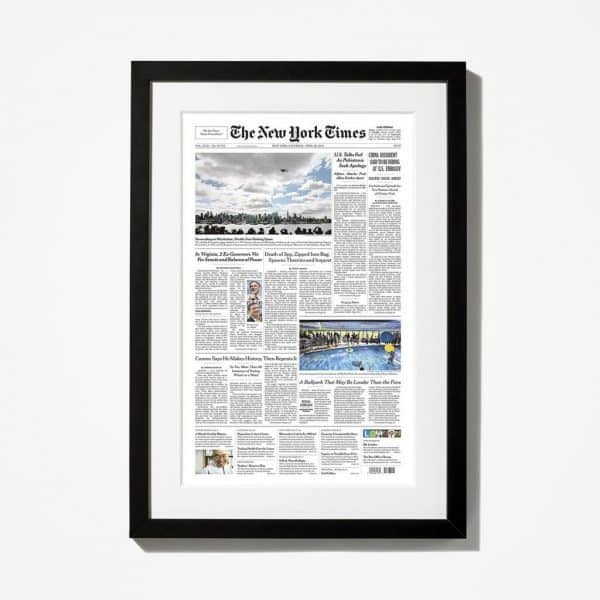 Another unusual gift is a poster print of The New York Times front page from their wedding date. It’s available in 3 sizes, either framed or unframed and will make a marvelous addition to their decor! 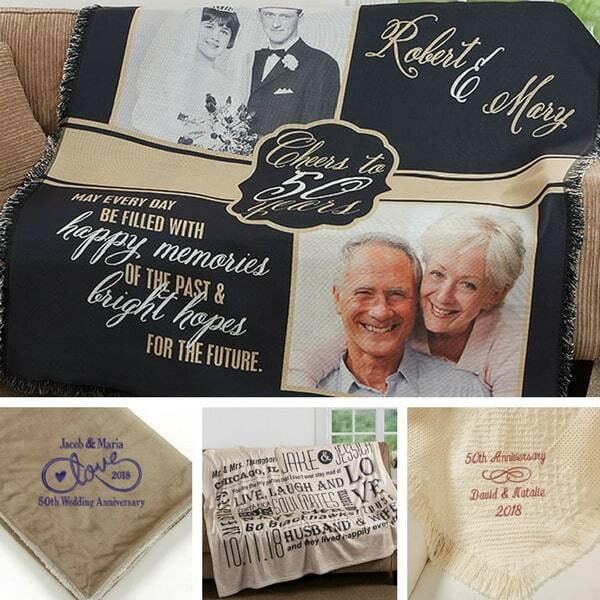 Wrap your favorite couple in 50 years of love and memories when you give them a personalized blanket that celebrates their golden anniversary. Personalization Mall has a wonderful collection of fleece blankets and throws that are perfect for this occasion. 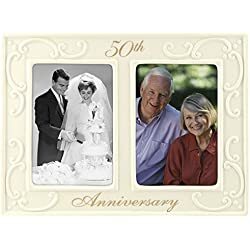 If you have lots of pictures, you could add them to a photo blanket – what a fabulous way to display 50 years of memories! The blankets are perfect for snuggling up in on cool days, or they look fabulous spread out on a sofa or even displayed on the wall. 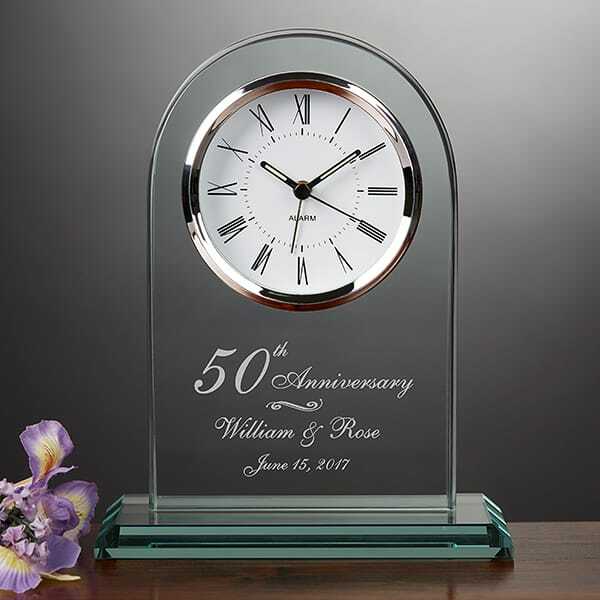 Impress the celebrants with a custom-made gift that features their name and wedding date. 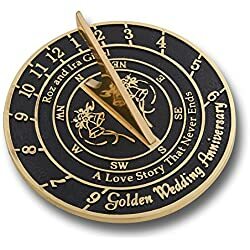 A fiftieth anniversary is all about celebrating the time a couple has spent together, so a clock is a wonderful way to represent that. Check out the personalized 50th anniversary clock at Personalization Mall. A commemorative clock is a gift that’s elegant, useful…and doesn’t take up a lot of room! Keeping with the theme of time, personalized matching watches are another fabulous gift to celebrate this milestone event. 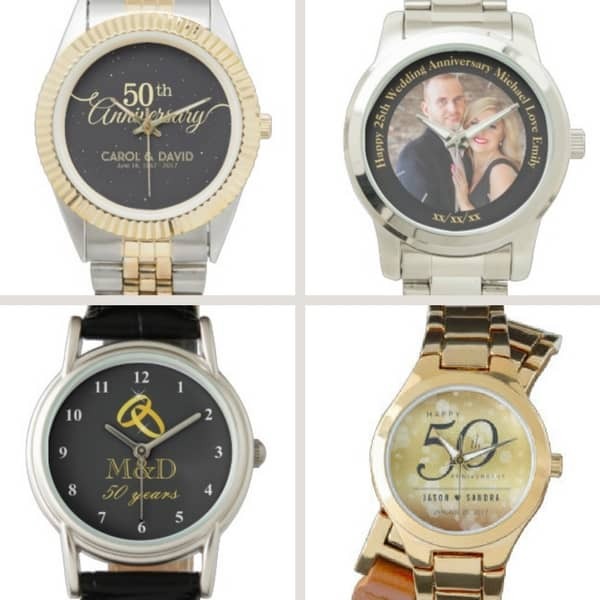 Zazzle features over 200 watches that can be personalized – you can even add the couple’s picture to the watches. Tip: Each of the watches are available in both men’s and women’s styles. When you get to the personalization page for the watch, you’ll find a Made For box where you can choose styles for men or women. 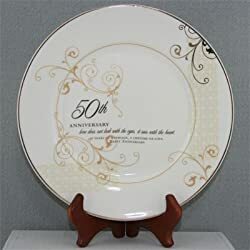 A beautiful plate that features their name and wedding date makes a wonderful display on their wall or in the china cabinet. 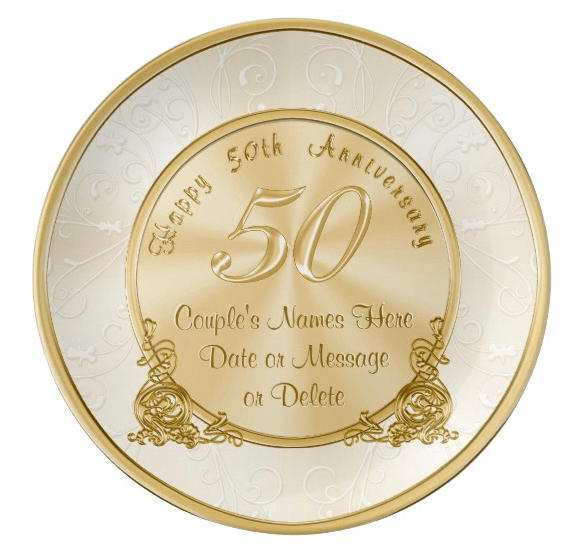 Zazzle has a fabulous selection of custom-made plates for a 50th wedding anniversary. You can even add the couple’s photo to some of the plates! You don’t have to spend a fortune to get an impressive 50th anniversary gift. Each of these gifts are under $25, but are sure to delight the couple! Have you left your shopping until the last minute? 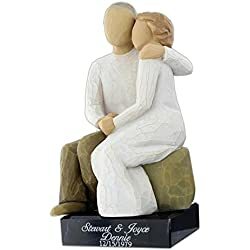 The couple will never know you’ve waiting when you send them any of these quick shipping gifts! 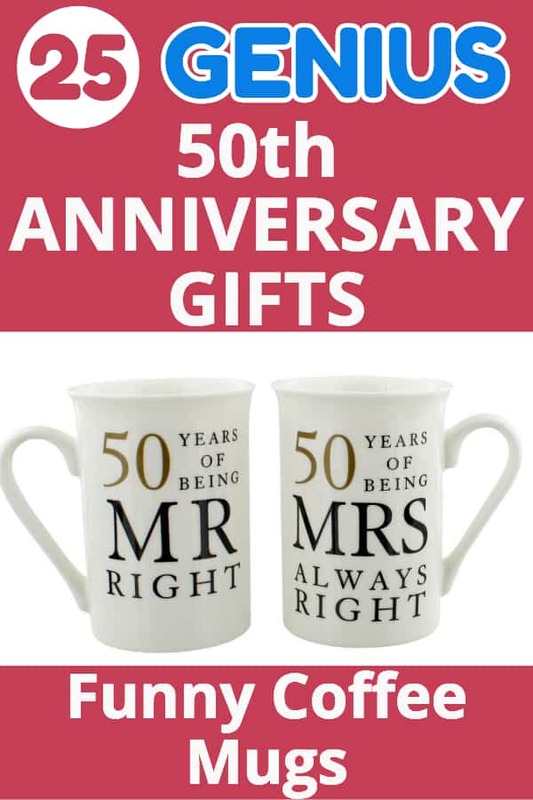 If you’re the creative sort, why not give homemade 50th anniversary wedding gifts? A handmade gift is a gift from the heart, and the lucky couple will treasure the effort you put into making it. 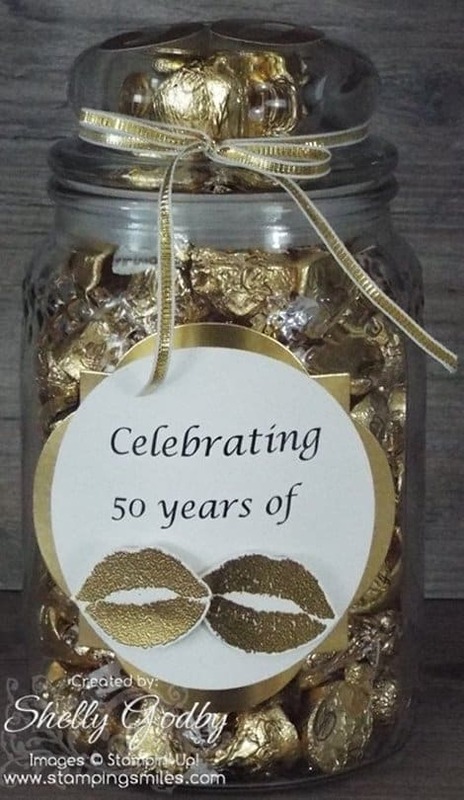 How cute is this 50 kisses for a 50th anniversary candy jar? It would be so easy to make…perfect little DIY 50th anniversary gift idea for the couple with a sweet tooth! This adorable DIY gift is perfect for the sentimental couple! 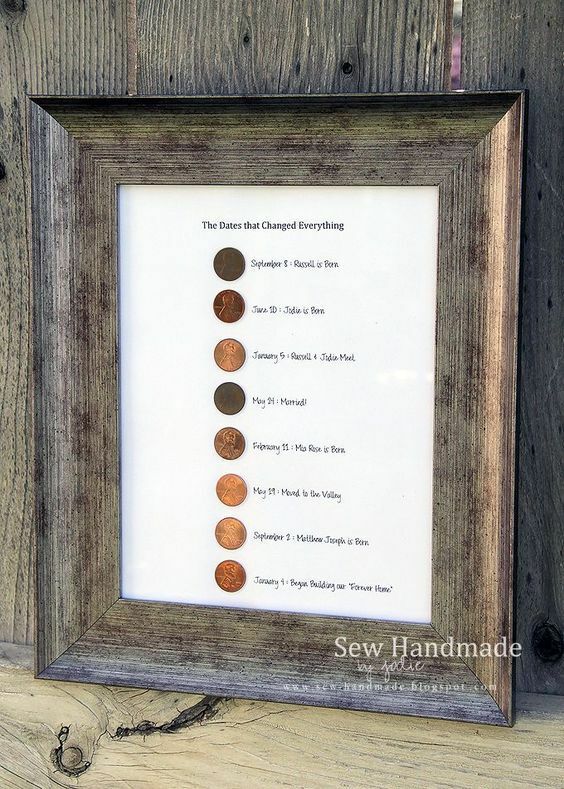 Jodie over at Sew Handmade made this with pennies from the most meaningful dates in her parent’s lives. It looks like she just glued the pennies to heavy cardstock and then wrote a brief explanation of the date. So sweet! The loving couple will love displaying this adorable photo gift from the grandchildren! It takes just a bit of planning to take the pictures, but when you’re done you’ll have an amazing present that is sure to WOW everyone. 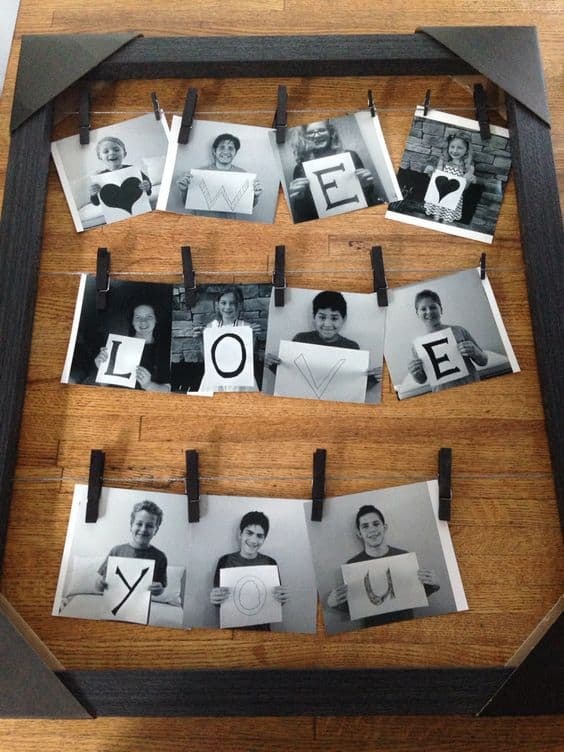 Once you’ve gotten the pictures made, simply add them to a shadow box using miniature laundry clips and twine. 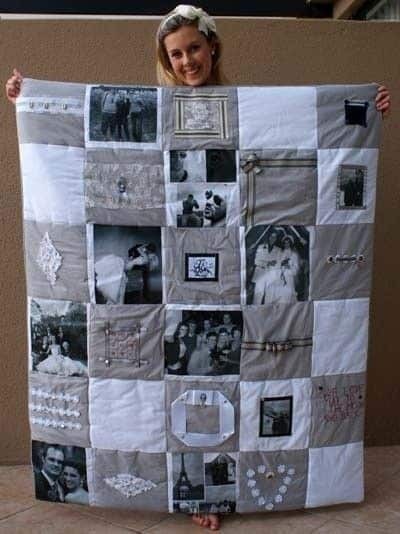 Thrill your favorite couple on their fiftieth wedding anniversary with a homemade memory quilt. You can make this at home by transferring photos to quilt blocks…it’s a fabulous gift to make if you are the crafty sort! Not into sewing? You can create a photo collage blanket so easily at Zazzle by simply uploading photos. 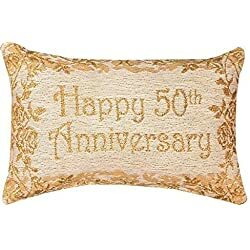 What is the Traditional 50th Anniversary Gift? 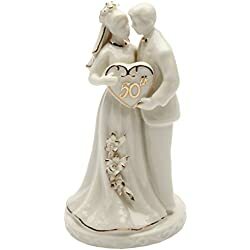 The 50th anniversary is known as the Golden Anniversary, so the traditional wedding gift is gold. 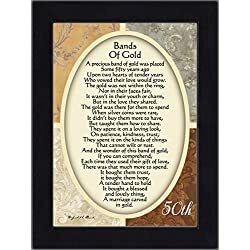 Gold is also the modern 50th anniversary wedding gift. 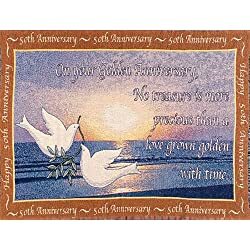 If you want to send flowers, the traditional 50th anniversary flowers are yellow rose and violets. 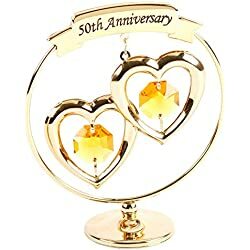 The gemstone associated with the 50th anniversary is also gold. 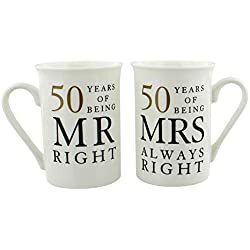 My first stop for impressive 50th wedding anniversary gifts is The New York Times Online store. The couple who has everything will love their best-selling personalized wedding anniversary book that contains all 50 New York Times front page from their anniversary date. 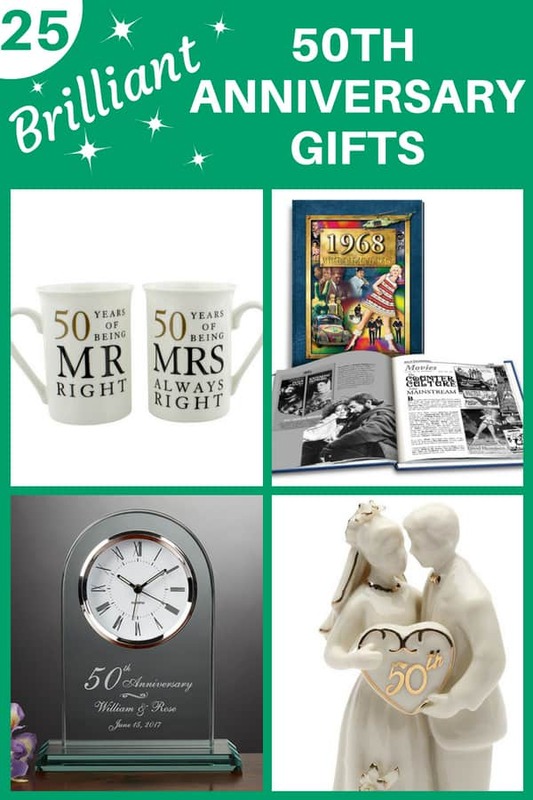 They also offer a jigsaw puzzle or front page reprint from the wedding date….what a fabulous look back at what life was like when they were first married! 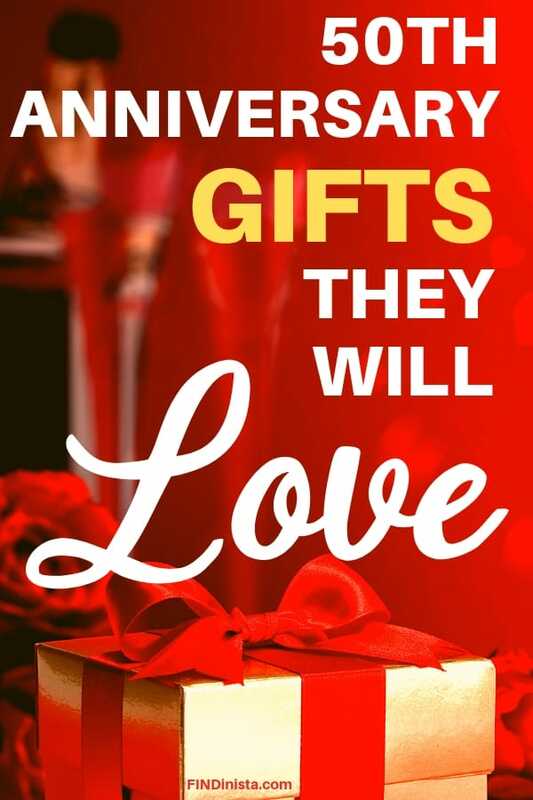 For personalized gifts, hop over to Personalization Mall and check out their selection of golden anniversary gifts. They feature over 50 top-notch gifts that can be custom-made just for this special occasion. Many of their gifts can ship in just 1 day – perfect if you’re looking for a last-minute gift!